Melt the Butter in the Microwave, and then mix in the two Sugars with a hand blender. Add the Egg (or Egg substitute), Milk and Vanilla and blend for 2 minutes until light and fluffy. Add the Flour, Salt, Baking Soda, Xantham Gum and stir well by hand. Finally, add the Chocolate Chips and make sure they are well stirred into the mixture. Now, a very important stage - refrigerate the mixture for 1 hour. Any less, and it will "run" on your baking trays! After the hour is nearly up, preheat the oven to Gas Mark 5. 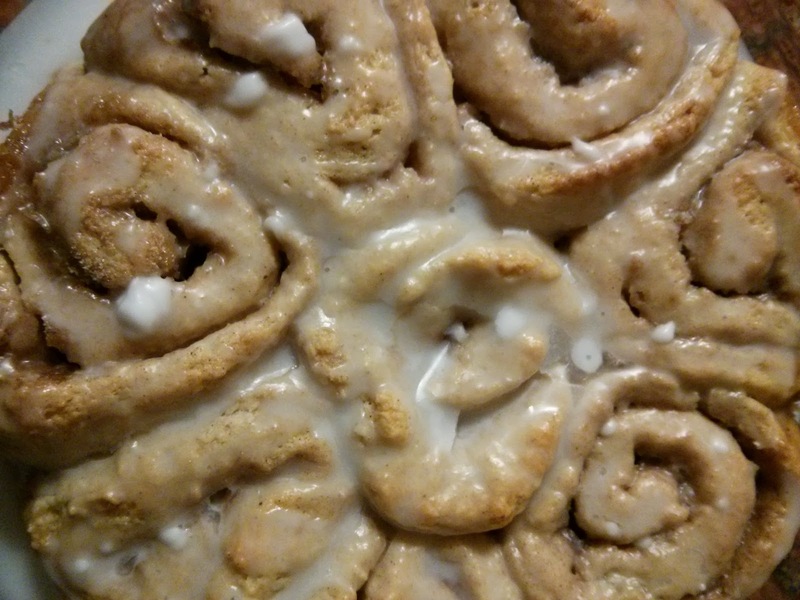 Line a baking sheet with baking parchment (not Grease Proof paper! ), and shape the mixture into 60g (2oz) balls, and press lightly onto the baking sheet - no more than 6 cookies per sheet. Cook for 7 minutes, then rotate the tray. Cook for 7 more minutes. Using the back of a spoon, press the cookies flatter on the tray so they are nearly touching, and then cook for 5 more minutes. 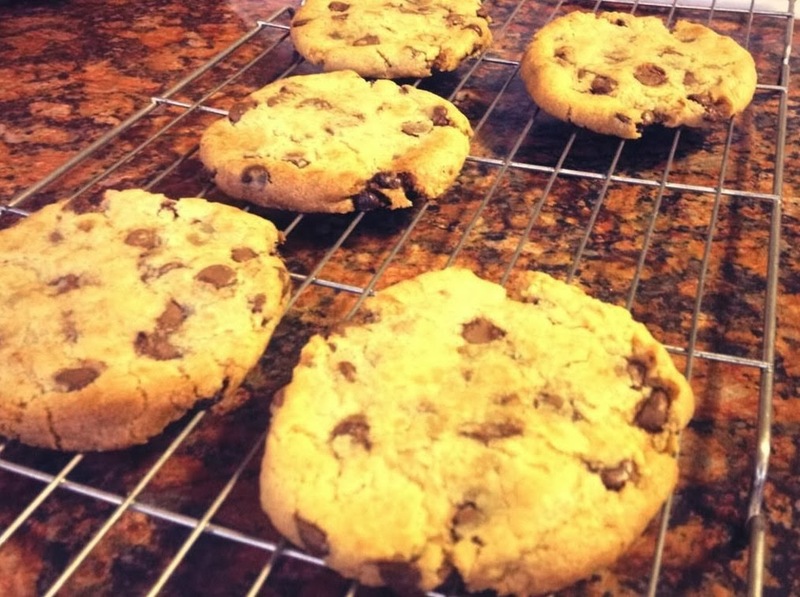 Remove from the oven and allow to stand on the baking sheet for 2 minutes, before transferring to a wire rack to cool. Daddy and I always plan to make each other a Christmas gift as our gift to each other, then occasionally if budget allows we end up buying a present for each other too. Last year it was our Google Nexus tablets (best gift ever) and this year it was a car. For the last few weeks we've been talking about buying a new car. Our current car, whilst the best car we've ever owned (apart from the Rover which drank petrol), is getting on a bit and it's starting to cost more and more to have it repaired and we figured that this year would be the year that it would finally cost more to repair than it was worth/cost to buy a new one. The children and I were out doing a few last minute pre Christmas Eve chores and the clutch on the car went. I don't think I have ever prayed harder than I did when I realised we were a couple of miles from home and the car probably wasn't going to make it. Through prayer, some nifty driving and a lot of luck we made it home, where a quick phone call to Daddy authorised him to go and buy a replacement car as prices in Birmingham seemed to be a little lower than here in Milton Keynes. Daddy came home with this. 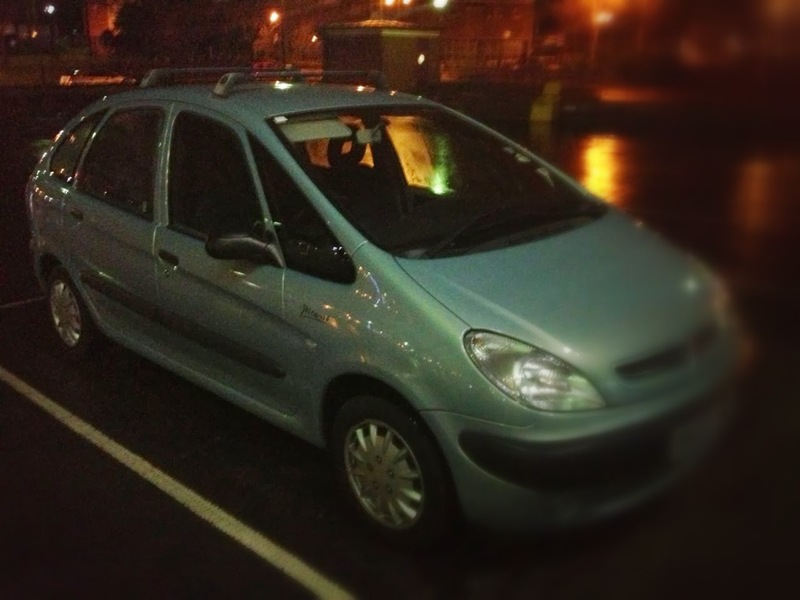 That's the same car as we already have, apart from it's blue and a few years newer. Oh and it doesn't have a sunroof, or a CD player. And it does have a wobbly rear view mirror and a wiggly drivers side wing mirror. Daddy has now told me off for pointing out all the faults, but I'm just saying how it's different from our car! So that's our unexpected Christmas gift for this year. Did you get anything that you weren't expecting? The meal plan for this week is a simple one, mainly because I keep forgetting what day it is and what days Daddy will be home with us. I've also gone for easy meals, as until the children are back to School I like to be spending my time with them not with the cooker! 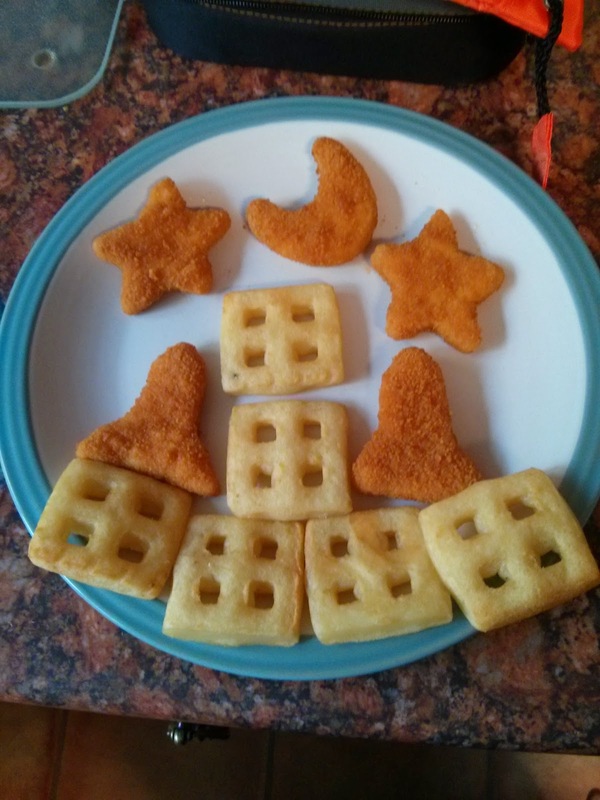 The children are going to have home made chicken nuggets and Daddy and I are going to have a curry. We're having a roast in the evening, using the ham that is leftover from Christmas. I think that the ham will do well cooked in Orange juice and Cranberry sauce. 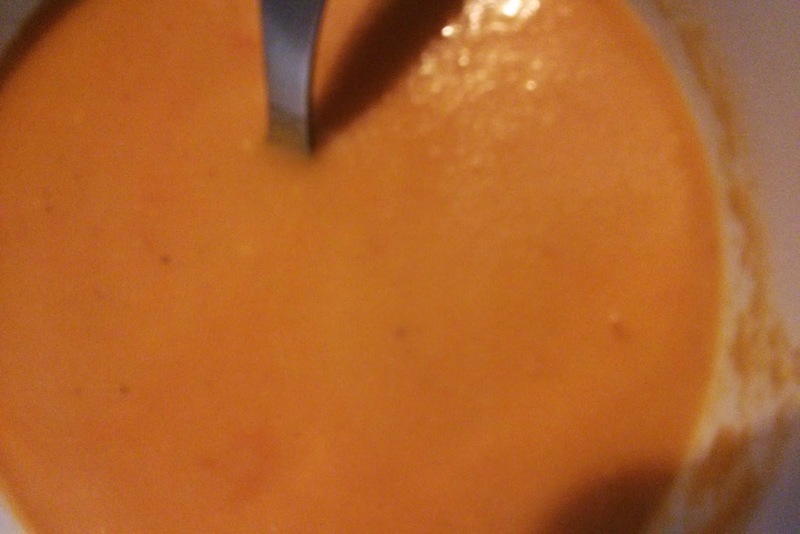 I love my soup maker so much, that's all I'm going to say on this matter. I was thinking during the week about making a fish lasagne, or rather making a fish pie that was a little different from normal and came up with the idea of a fish lasagne. I have no idea how it will taste or if it has ever been done before! Knowing how Daddy isn't keen on fish, I've done it on a day when he won't be here. I'm a fan of simple meals and there is nothing more simple than either beans or mushrooms on toast. I gently dry fry the mushrooms and tomatoes and serve over a couple of gluten free rolls smothered in butter and it has to be one of my most favourite meals! It is Top Ender's birthday tomorrow and she wanted to have Sausage Pie for her dinner, but we decided that as Daddy was going to be eating with us tomorrow we should have it tonight. As is tradition in our house when it is your birthday you get to choose what everyone has for dinner. Top Ender decided she'd like the BBQ burgers we've had a few times, although I think she might be expecting several just for herself! This is Stella, our Makie doll who arrived today in the post. Top Ender has been beside herself with excitement, since she designed the doll knowing that she was on her way thanks to some cleverly timed emails from the guys at Makie (it happens for everyone who designs and orders a doll, not just us) and has been on the website almost constantly creating new outfits for Stella. As you can see Top Ender was thrilled with her creation, and as soon as she had Stella out of the tube, she sat on her bed and was playing various games with her. Tops loves that she made Stella, that she was the one who got to decide what she looked like and is basically her Mother. I just love that Top Ender is happy. We were given the doll to review. I can't believe how quickly this weeks has come round, I read something recently which said that the way we perceive time as we get older means it really does speed up, which must mean it's constantly this time of year for The Doctor or possibly Easter as they are the main times he's on the TV. Anyway this is our meal plan and general plans for this week. Daddy hasn't had this for a while, so we're having it tonight. Last year we were supposed to have a Lasagne on the Sunday before Christmas Day. 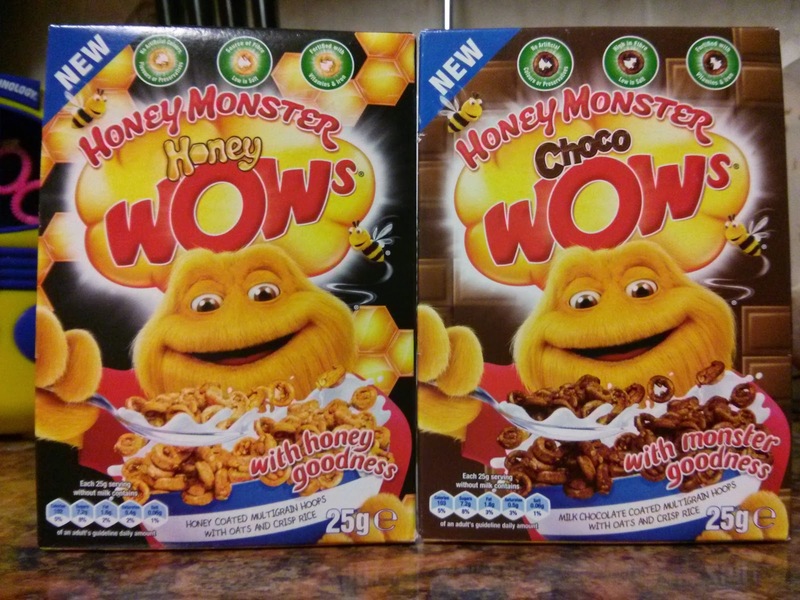 I can't remember if we did or not because I was ill with the Winter vomiting bug aka Novovirus, and Daddy was just about to come down with the same (the children had already had it) and it was one of those surreal few days. Top Ender decided that we should have Toad in the hole. The Children mishead me say sloppy Joe Pizza Bread and I decided that from now on Sloppy Joes are called Sleepy Joe. Anyway whatever it's called we're having it for dinner tonight! As Daddy is away in Birmingham I get to have double as he'll have no need for it! As I mentioned last year, it is tradition on Christmas Eve that we have a Chinese meal. This year we're making our own version for Daddy and I (unless I magically find a wad of notes having fallen down the back of the sofa after getting back from the Christingle service at our local COE church) and the children are having a McDonalds (their choice!). Like most of the UK, today I'll be sitting down to my largest meal of the year, complete with a Prawn and Mackerel starter, a Roast Turkey with all the trimmings (and then some) and pudding. Eventually we'll collapse on the sofa and make a start on the leftovers, unless I've already thrown them all into my soup maker of which you have a chance to WIN ONE! Yup, come back here on Boxings Day to enter. If I did throw all the leftover vegetables into the soup maker last night then today we'll be eating soup for tea, with some lovely bread. If I managed to leave some in the fridge then we'll eat them with Ham, because it is TRADITION and this time of year is all about tradition. Depending on what we've eaten, there should still be leftovers for us to eat, as there will only be the three of us as Daddy is back at work today. We don't mind though, because seriously who doesn't love a good Christmas meal?! Gluten free cookie recipes come, and gluten free cookie recipes go, but this recipe may provide the closest gluten-free cookie yet to the "real thing"..
After the crazy that was last week, we have a much more sedate week planned, but we're making sure that we keep the fun going and that we are all still very much in the Christmas Spirit. We should be attending our Church Christmas Party today, I'm making a Winter Coleslaw and after our party (where Santa will be coming) we're popping to a local Old Folks home, (which has become a ward tradition now) to perform our Nativity (Wish us luck we are so going to need it) and sing some Christmas Carols with the residents. I love that we do this as a ward/community as it makes us feel so much closer together. I'm going to do a light evening meal of Chicken Burgers because the children may have eaten strictly more than necessary at the Christmas Party! I've gone with a Casserole for today as I don't want to overdo the roast this close to Christmas! Tops, BB and I are going to my MIL's home for our evening meal tonight. Holiday Inn have a great Magical Mealtimes experience happening at some of their Hotels, with condiments for younger guests for a limited period of time, it includes ketchup piping bags, roast dinner flavoured straws, chocolate spoons and herb party poppers. Tonight we're going to be using the condiments to have some fun with our Salmon and Wedges. The condiments are available at Holiday Inn Manchester (Media City), London (Camden Lock), Stratford, Birmingham City Centre and Edinburgh. There are some in Germany too, so if you're heading over this Christmas let me know! It's Top Ender's School concert tonight, so I'm doing a nice warm and quick dinner of soup and toasties. Hopefully it won't repeat on her in the middle of singing or playing the Violin! If I'm really good I could make sure this was ready to eat almost as soon as we got home from school, but seeing as tonight we're going to go and see Santa at School it might not be wise and we might have to wait until we come home before I throw this into the oven! It's the last day of School for us, until January 6th, so we're celebrating tonight so we're going to either pick something we love that's in the freezer or something that we can go to the supermarket to buy the ingredients for whilst wandering around the store! We were sent the Holiday Inn Magical Mealtime Condiments to have some fun with. Do you remember in the summer, when I started sorting out the garden that the Children found a fairy door at the bottom of our Pear Tree? Well, when it started getting a bit colder and wetter, I thought that it might be smart to let the Fairies know that it was okay to move their door to somewhere a little easier to access. You know somewhere that you wouldn't have to cross the wet grass and mud to get to. 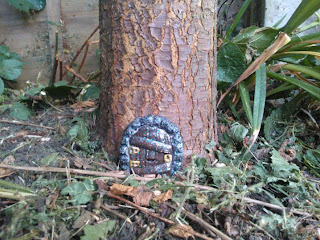 The fairies thought this was a great idea and enlisted my help to help them find a suitable place to move to. Don't suppose anyone remembers me tweeting about it do they? Tonight saw Daddy racing home from work in Birmingham to join us in our traditional visit to the Panto each Christmas. We were off to Milton Keynes Theatre to see this year's production of Snow White and The Seven Dwarfs and we knew that we were going to have a good time. 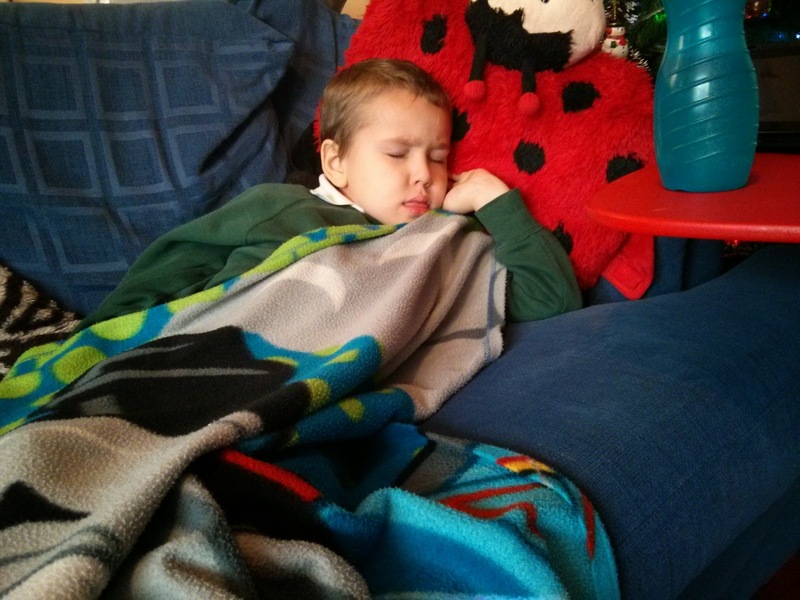 As most of you know, Big Boy is off School sick at the moment. I decided to do something special for him, to take his mind off his ear ache. This is the story of how it went. Whilst I went upstairs to do a few chores, I checked in on Big Boy using the CCTV in our living room and saw this. That's right Santa came to our house, and checked his list whilst Big Boy was watching a video on Youtube and oblivious to the fact that Santa was standing just a few feet away. Big Boy is thrilled that I managed to capture it on my phone though, and has told everyone about how he didn't realise Santa was so close to him. If you fancy making sure you're aware when Santa comes to your house, check out the Kringl website for details. This wasn't paid for, I just happened to really like this app. Top Ender, Big Boy, Daddy and I were lucky enough to be invited down to a premier of Frozen Disney's newest animated film. We'd seen the trailer for it months ago, a snowman sneezed his nose into the middle of a frozen lake, where a reindeer (who acted more like a dog) tried to get at it presumably to eat it and we were excited. We were even more excited to know that they were taking inspiration for the film from one of my favourite Hans Christian Anderson stories, The Snow Queen. I know, I know. Every time I see a Disney film I fall in love with it, and I claim that the latest one is the best so far and that this one is magical. You need to remember though that I am a true Disney fan (I've even seen films that some of the people at Disney I sometimes talk with haven't) and I'm also someone who appreciates a good story and Frozen is that. The musical score is fantastic, the children and I haven't stopped singing Let It Go, or Do You Want To Build A Snowman or my favourite Love Is An Open Door and when the Soundtrack was released a few days ago I was amongst the first to buy it! See below for a chance to win your own copy. There are some moments in the film that will have you crying, laughing and recognising your own family dynamics, even though none of you are the sister to or indeed the actual sister who is a Princess with powers to create snow and ice. There is one moment when the audience realises something that I don't want to be a plot spoiler, but when we were watching the film every single woman in the audience gasped in shock. I think it takes something truly magical to take in envelope an entire theatre into a story. I really do suggest you go and see this film this Christmas, it's feel good, it's got great music, great imagery and it's got snow! And if you do happen to pop into the Disney store, they have the most adorable Toddler dolls of Anna and Elsa which I'd really like for Christmas. TE. 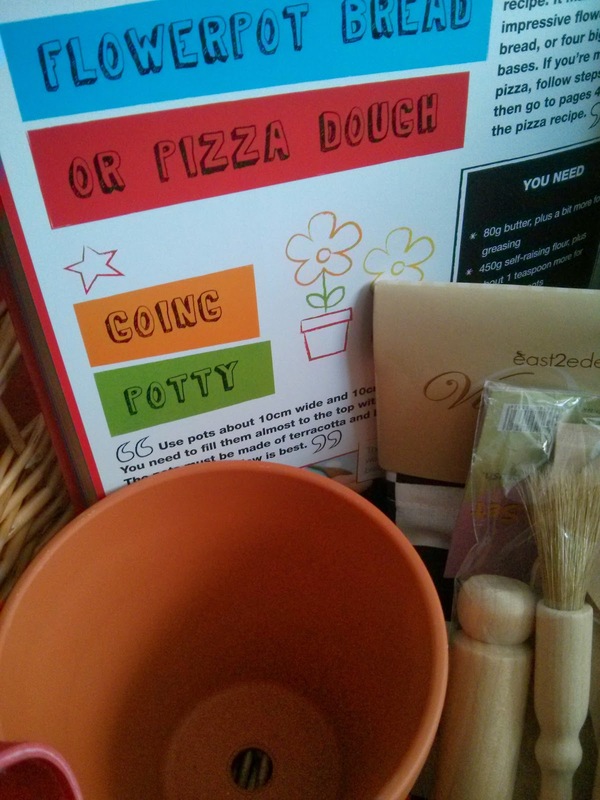 Sorry Top Ender, seems to think this blog post is her Christmas wish list. Seeing as she's not looking right now I'll let you know that I've brought the dolls for her, because as she said they are rather adorable and will sit nicely with toddler Merida from Brave. Now for the giveaway. We have 3 copies of ‘Frozen’ The Original Motion Picture Soundtrack - which features a recording by Demi Lovato - to give away. Frozen OST is out to buy on 2nd December from Walt Disney Records and includes music and songs from the festive new movie from Disney. All you have to do is leave a comment below answering What is your favourite thing to do in the Snow? We were given tickets to see Frozen at a special Press Preview. I can tell he's ill as he hasn't asked to use the consoles. He doesn't want me to sit and hold him. He doesn't want to get out of his school clothes into something more comfortable. He just wants to sit (well lay) and feel sorry for himself. So I'm just sitting here watching him and wishing I could make him feel better. 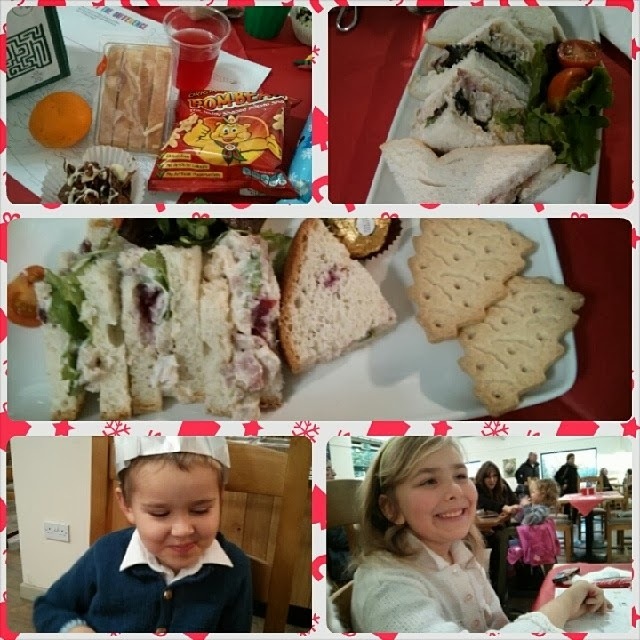 I mentioned in our traditions post that we have tea or breakfast with Santa each Christmas and we went for tea with him yesterday. When Santa came to our table I took a picture on my phone (it's my Google Nexus, I didn't want to drop the Nokia whilst out) and somehow managed to capture the magic around Santa. Can you see it? Can you see the magic sparkles? 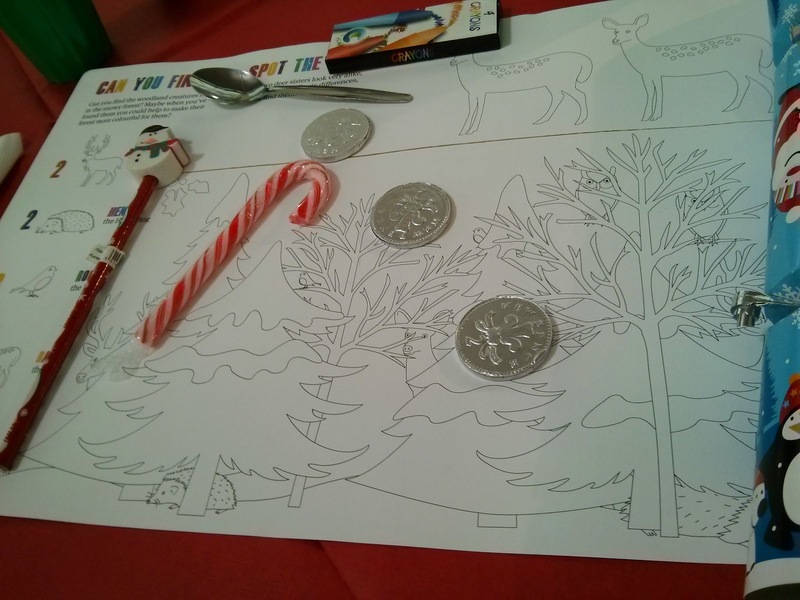 Before that though, we had arrived at the restaurant, we were shown to our table, which had been reserved for us with our names and dressed with festive tablecloths and colouring in mats and crackers for the children. We were served some food and drink and a friendly Elf came by to make sure we had everything that we needed and wanted and to let us know that Santa would arrive after we had eaten and decorated our Gingerbread cookies. Daddy was most impressed that his meal was Gluten free and that it tasted lovely. The staff were quite knowledgeable about other products they had, including fish and chips and one lady apologised that she had put a chocolate on Daddy's plate that he couldn't eat, but suggested he might like to give it to me. I liked that lady! The children got busy eating, and colouring and chatting and decorating their Gingerbread men. 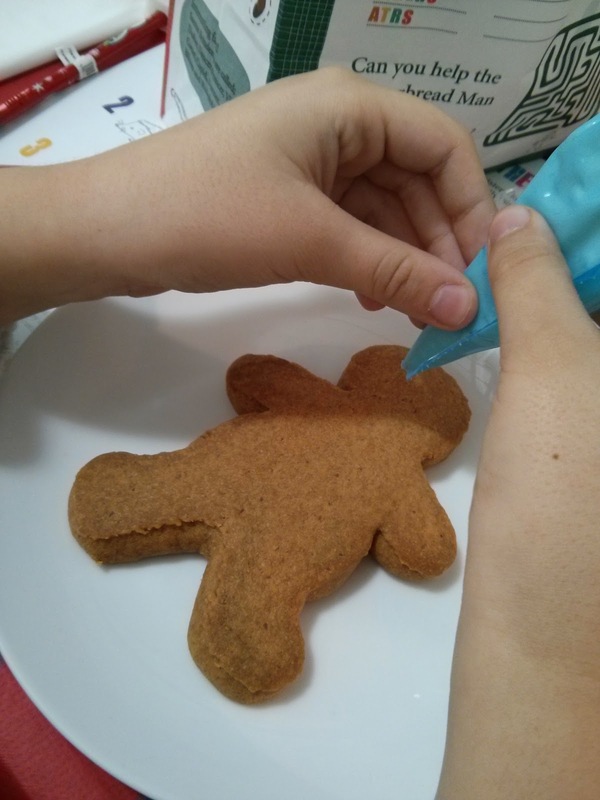 Well, I say they decorated them, as far as I could see Big Boy thought it was just easier to skip the decorating and eat the icing. And then Santa arrived and I took the photo that captured his magic whilst he spoke to each of the children and he confirmed a few of our family traditions as being started by him. Santa asked what they'd like for Christmas and if they were having a nice time and whilst he went to the other table we were able to discuss if this was the real Santa, or someone helping him out seeing as Santa gets busy at Christmas. A little while later and we were taken off to Santa's grotto where Santa read the children a story before letting them choose a gift from a selection he had supplied from the North Pole. We all had a good time and I love that it was the Real Santa, proof provided with that magic photograph I think, and that he takes the same level of care visiting with the children at the grotto as he does if they were visiting him in his own home. 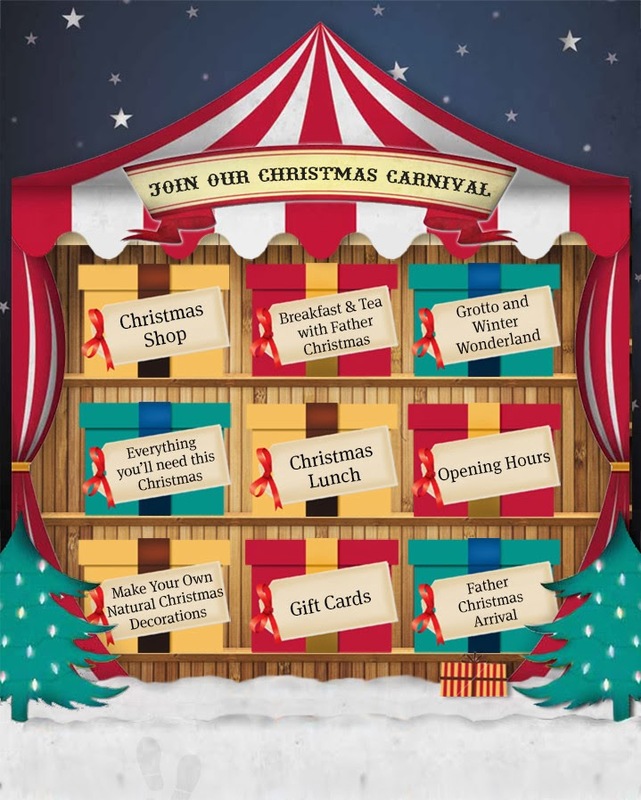 If you want to book tickets to have Breakfast or Tea with Father Christmas, then take a look to see if there is an event taking place at a near or convenient garden centre to you! We were gifted the tickets to see Santa. This week is an almost back to normal week, as Daddy will be home with us almost every night this week... but it's also a REALLY busy week with a lot of family stuff going on. I am so EXCITED! We're off to have tea with Santa tonight, before I head off to do the shopping with my Mum. Daddy and I are just having a bit of cake, but we're going to have a late supper of Curried Rice Noodles with something from my new Recipes from an Indian Kitchen. We're really looking forward to this. Well I am. I'm loving poached eggs again at the minute, especially when with some Haddock. Hopefully the children will agree, Daddy won't care because he's staying in some posh hotel tonight! We're off to see the Panto tonight, so we're having an early tea. I think that we're just going to go for something simple like a Hot Dog or Cheese, Tomato and Onion Toastie. Plus knowing my children and their fondness for ice cream at the theatre, it's probably wise they only have something simple! Top Ender has gone with School today to see the Houses of Parliament and Big Ben. Our local MP invited Top Ender and the oldest few classes to come down and see what goes on following on from their topic last term. As she is going to be late home, we've decided that we're going to go for a Sausage Bean Casserole, which I'm really looking forward to. 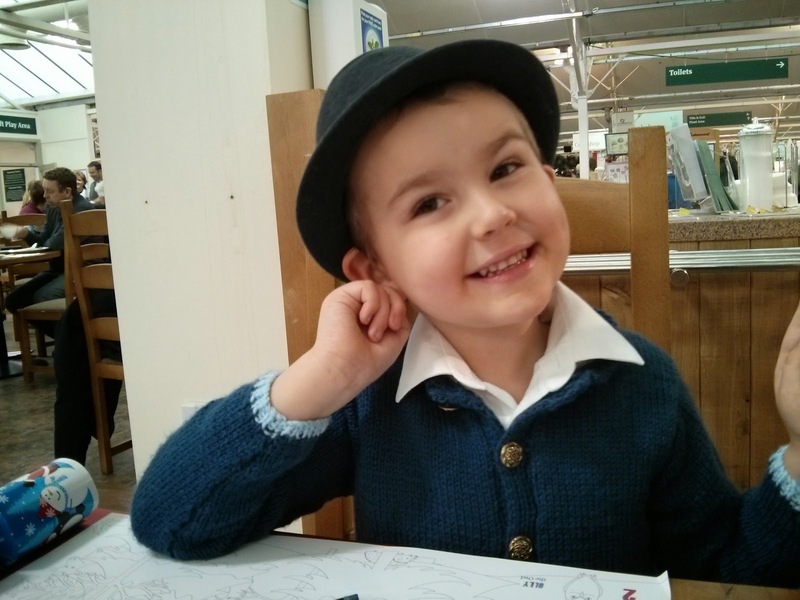 Today Daddy and I are going to a meeting about Big Boy getting an Insulin Pump to help manage his Diabetes better. We'll be introduced to the pump, shown how it works, allowed to "play" with it and ask all the questions we can think of before going back home and taking Top Ender to the Theatre, where she is going to watch the Panto, for the 2nd time in a week! Did you know that Santa loves Fried Chicken? Well, he does it was in a book I read (The Autobiography of Santa Claus (The Christmas Chronicles) as told to Jeff Guinn) and so we're having Fried Chicken in honour of Santa tonight. We were given tickets to the Panto and to see Santa. 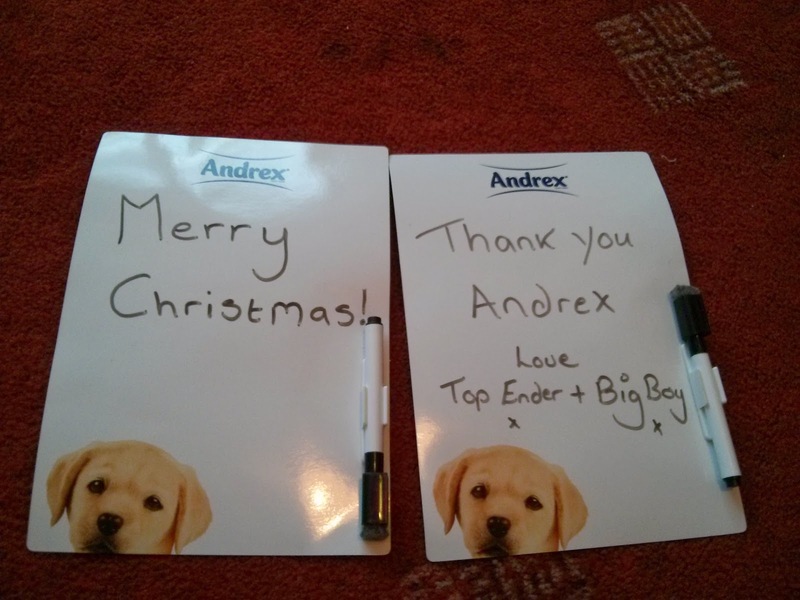 The other week when my Mum was buying Toilet paper, she asked Top Ender to chose which type of Andrex paper to have. Top Ender immediately chose the rolls covered in puppies and every time Tops and BB go to my Mums house, they disappear to the bathroom to look at the toilet paper. Do I have strange children, or is this something all Children do when faced with toilet paper covered in puppies? 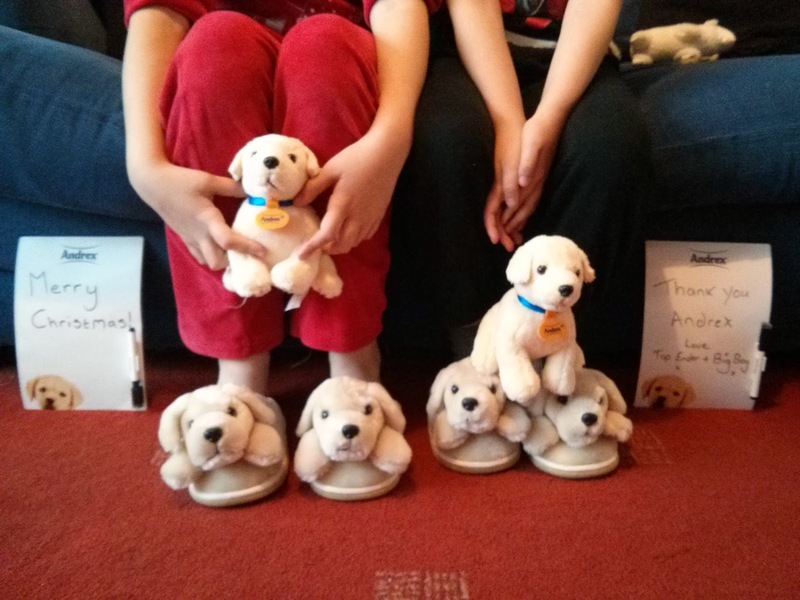 Then today the postman brought some goodies for the children as an early Christmas gift from Andrex. Are you an Andrex fan? I must admit like the children I have a fondness for the Andrex puppy but I just wish they were doing a Christmas themed toilet paper! My last phone, well now it's my one before last phone, was a Nokia Lumia. I was in love with it, as for a social media addict like me, it was perfect. When I dropped it outside of School and smashed the screen I was heartbroken, but I eventually found a new phone that I liked and could afford and only showed minor jealousy to the adverts on TV for the new Nokia Lumia 1020, with its 41MP camera and familiarity of a Nokia. 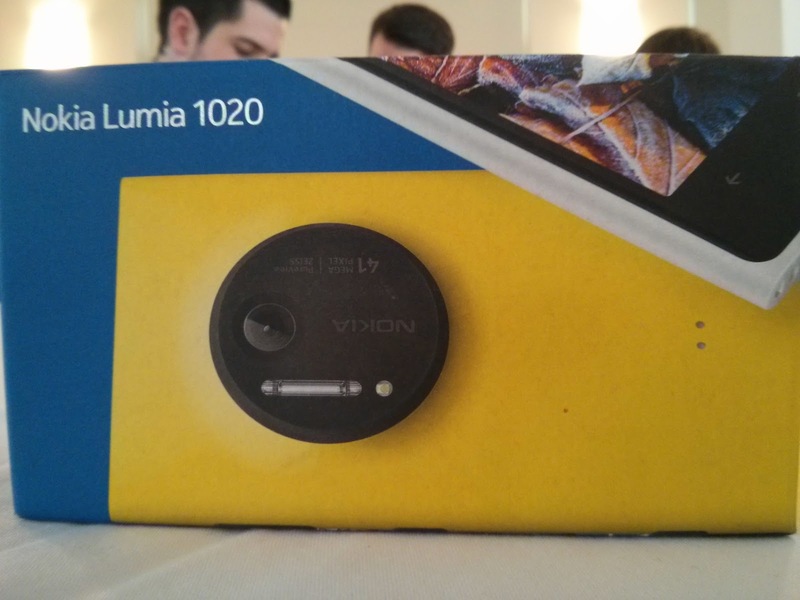 And then I was asked if I'd like to have a Nokia Lumia 1020. Unsurprisingly, given my love for my old Nokia I said Yes. Daddy and I both think that there are a lot of educational benefits to children having easy access to their own Technology. There is a lot of research that proves this too, of course it means that you have to make sure that the children are using technology for educational purposes and not for just entertainment, but there is no reason why entertainment can't be educational remember! The way that we look at it is that the world we live in is changing (and has already changed from the one that we grew up in), and all children (and adults) are going to have to master new technology as it develops and learn how to use it in their every day lives. 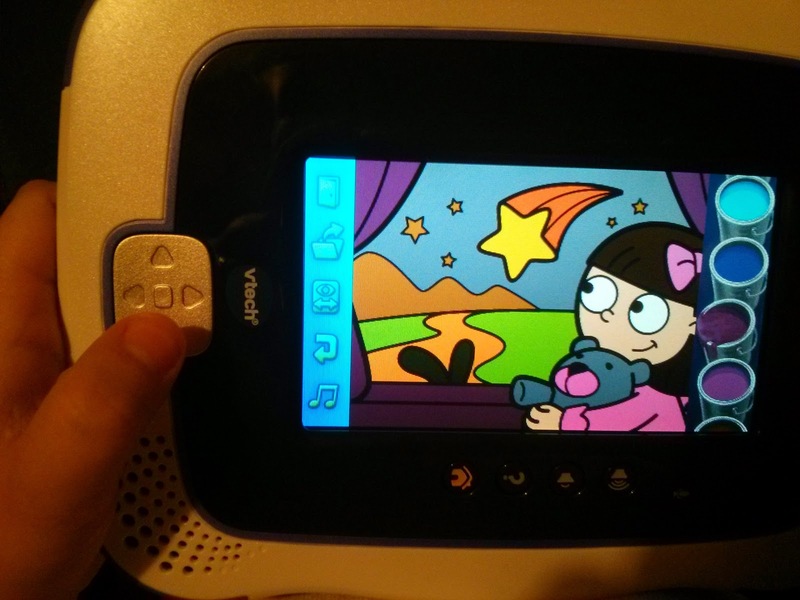 Allowing children to become familiar with using items such as tablets, gives them a good foundation to build on. 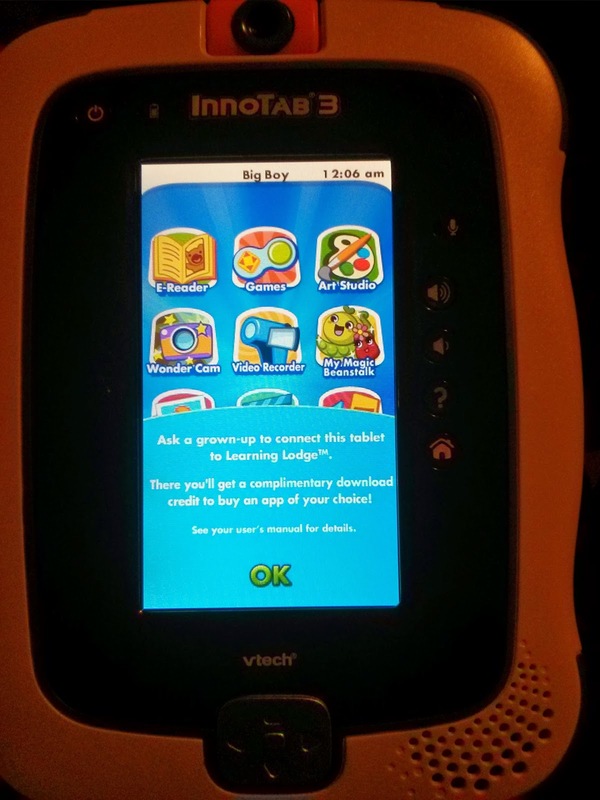 With this in mind, when we were asked if we'd like to review the VTech InnoTab 3, we said yes! 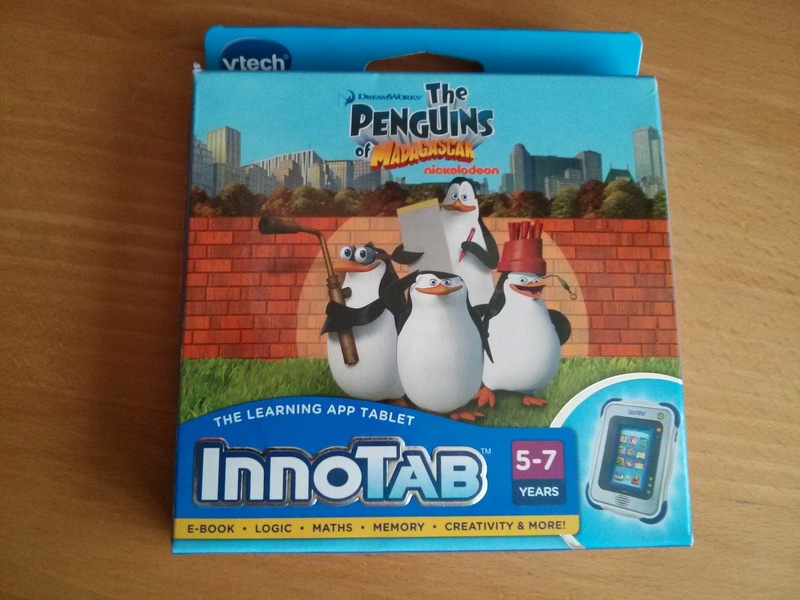 The VTech InnoTab 3 has a 4.3-inch LCD touch screen, which means that compared to a lot of other tablets in the same price range and market is a lot lighter and compact, perfect for little hands. The D-pad at the bottom of the screen, is perfectly positioned for it to be used whilst still holding the tablet comfortably and Big Boy soon discovered that he could use this instead of touching the screen to move around in apps and games and that he preferred it for some of the time. 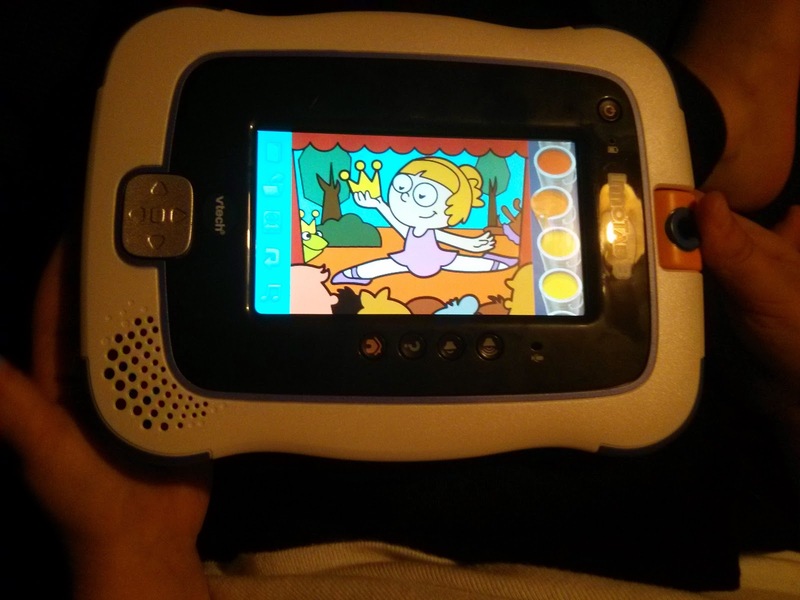 The 2mp camera on top of the screen rotates which allows the child using the tablet (or parent trying it out!) to take selfies or pictures of a scene in front of them. The camera also captures video, and there is a built in microphone so you might want to be careful that you don't get snuck up on as you could be being recorded for posterity! Big Boy did use the stylus, but I felt that it was a little pointless, seeing as you have a D-pad and a touch screen and I have a feeling that before long BB will be yelling that he's dropped the stylus down the back of the sofa never to be seen again. Big Boy loved the Art Studio and quickly got the hang of how to select colours and create various masterpieces from the colouring in pictures. As he could save the images he liked, he was rather pleased as it meant he'd always have a record. 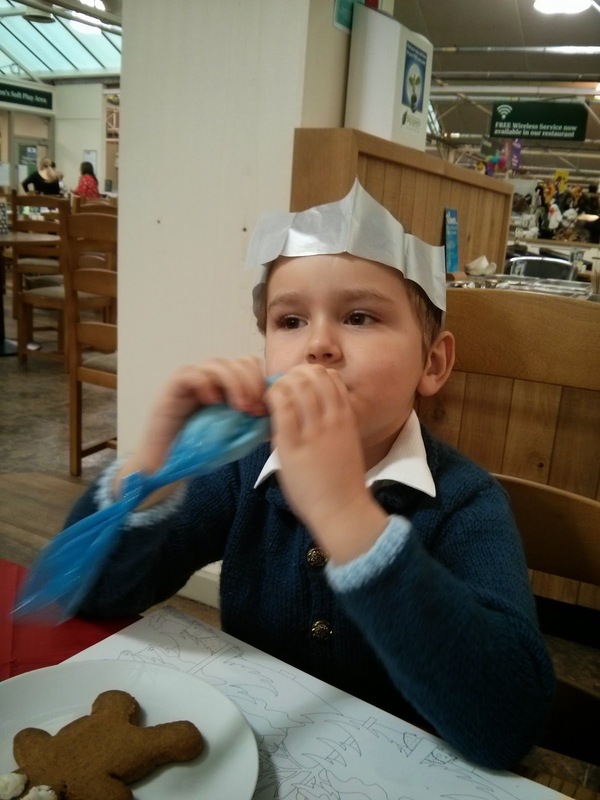 We were also sent a cartridge game, he enjoyed playing with his favourite Madagascar characters, The Penguins. 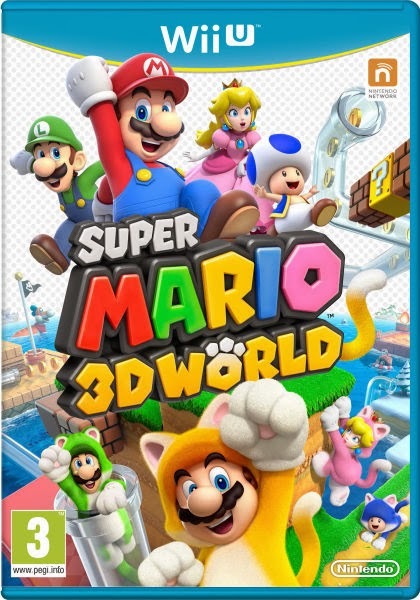 I love when you can add games like this, as it means that friends and family can buy them in the future as gifts as and when they come on to the market. Big Boy soon found the E-reader and sat down to read a story to himself, but quickly discovered that he could get the InnoTab to read it for him. This is great as it means that children learning to read can go at their own pace, but if they get frustrated they have the back up in their own hands to help them. There were plenty of games that Big Boy found to play, he was playing a science game, H20 Go, where he had to guide a little water droplet past obstacles that would stop him from getting home. Big Boy was really enjoying the game and didn't realise that it was educational and teaching him about the properties of water. 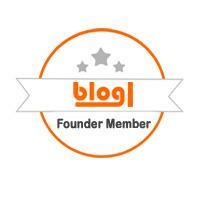 See fun and educational! 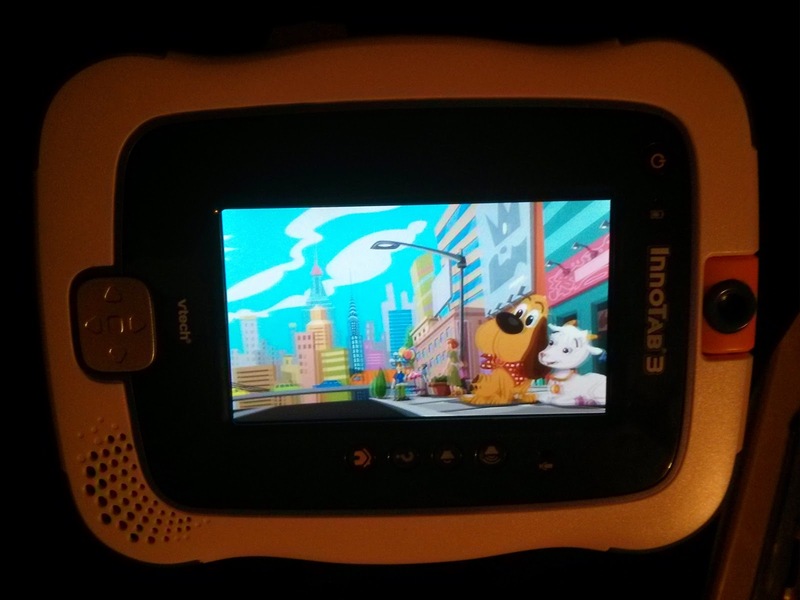 My sister has brought one of these for her eldest daughter for Christmas, as she is hoping that it will mean she'll get to use her own tablet more often and from the reactions that Big Boy gave to it (despite being used to having his own Android tablet) I think she might just find she will. 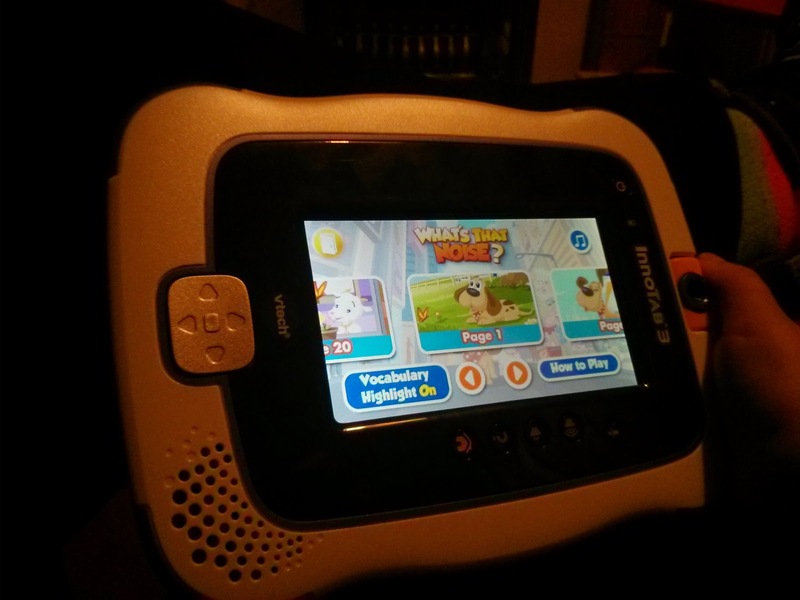 We were sent the VTech InnoTab 3 to review by Asda. Clinton's asked if they could send me some Christmas goodies which they are stocking in their stores this year to review. Being a complete and utter pushover for Christmas items, I said "Yes please!" And eagerly awaited their arrival. They arrived just before Halloween, and I had plenty of strange looks from visitors to my house, wondering why I had Christmas decorations hanging around the fireplace and plenty of comments on photographs I put on to Facebook and Instagram asking if I had started decorating super early this year! Normally, I would have taken a few photographs of the items and then gone and put them with the other Christmas Decorations in the loft ready for getting out for the first Sunday of Advent, but Big Boy and Top Ender and I fell in love with them and so we couldn't hide them away! 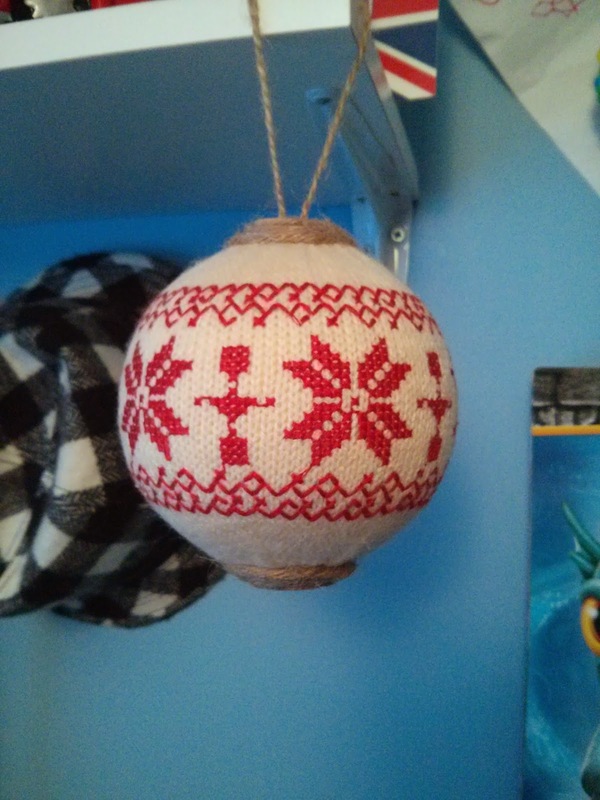 Big Boy decided that one of the Fair Isle Collection Crochet Ball, (£3) was his and he wanted to put it up in his room. It was a little too big to put it on his tree, so we hung it from his shelf. Top Ender has hung hers from her bed. The Christmas Tree Candle, (was £13 but I can't find it on the website now so it could be less) was mine, that was a given as the children aren't really into Candles and I always seem to have one burning. The problem is that, the candle is so beautiful that I don't want to burn it! I think that a drippy melting Christmas tree will be sad looking... still come Christmas Eve I'll have it lit and I'll post a timelaspe video of it melting into nothing before Santa comes. 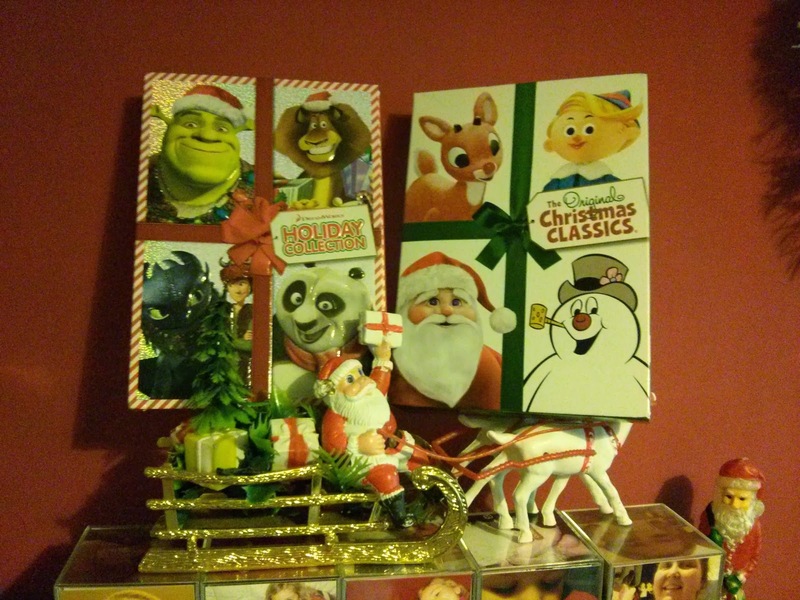 The last two decorations that we got to review were a singing Reindeer and a singing Snowman (£10 each). They are rather cute and have enthralled all the children (and a fair few adults!) who have come to our house over the last few weeks. Take a look at the video below to see why. Are you like me and love all things Christmas and mix and match accordingly? Or do you decorate to a theme? Leave a comment below to let me know. We were sent the Christmas items to review. Top Ender, unsurprisingly seeing who her parents are, is rather fond of modern technology. 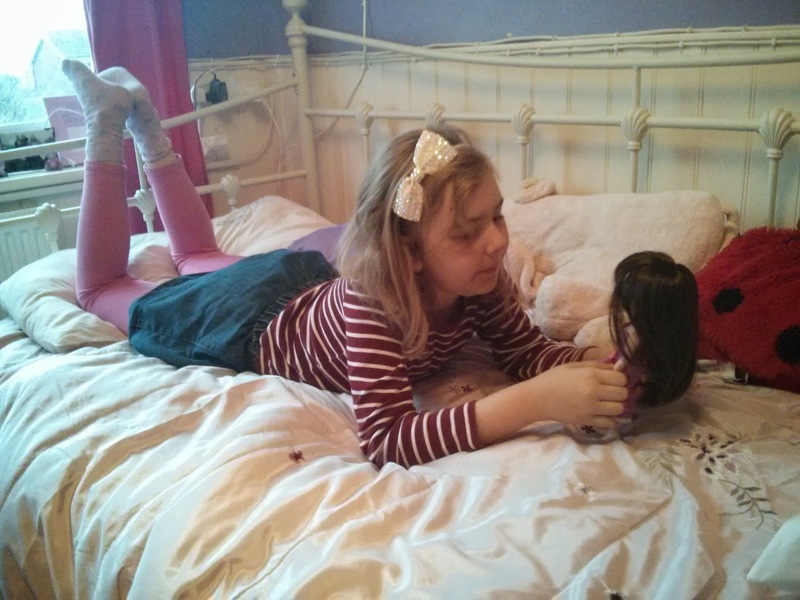 Top Ender is also Nine years old and rather fond of Dolls. Normally these two passions don't mix but the new Makie Dolls do combine these passions, which aren't just particular to Top Ender. Makie Dolls make use of the new 3D Printer Technology, by printing a doll that you've created using the Makie app or on their website. Creating the Doll, was just like creating a Sim according to Top Ender, the only difference being that at the end of it, once it's been sent to the printers it'll be turned into a 10" poseable action doll. Here's a little video of Top Ender first opening her box and then Top Ender and I creating the Doll on the website. 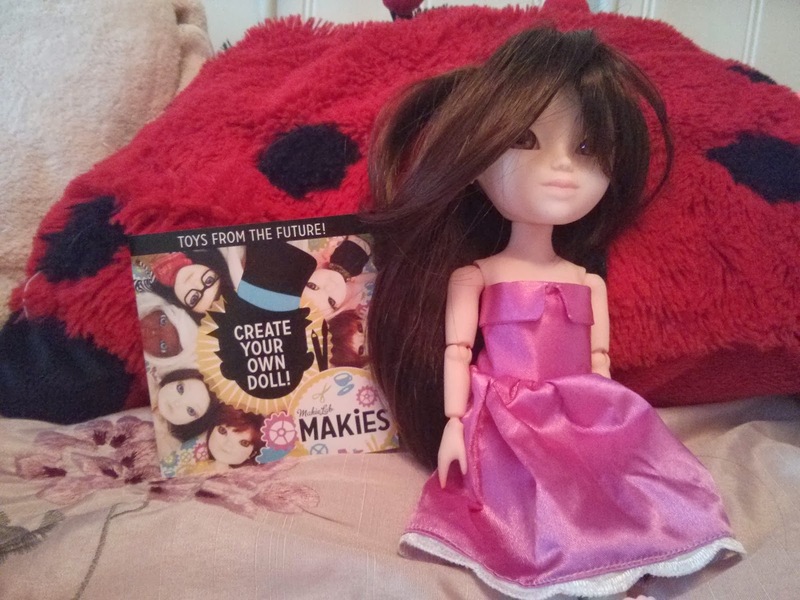 The gift box that Top Ender got to maker her Makie doll is £69, and is actually rather cool. You can't see in the video above just how cool it is, but it's on a spring, which means it wobbles and I think that's rather cool! 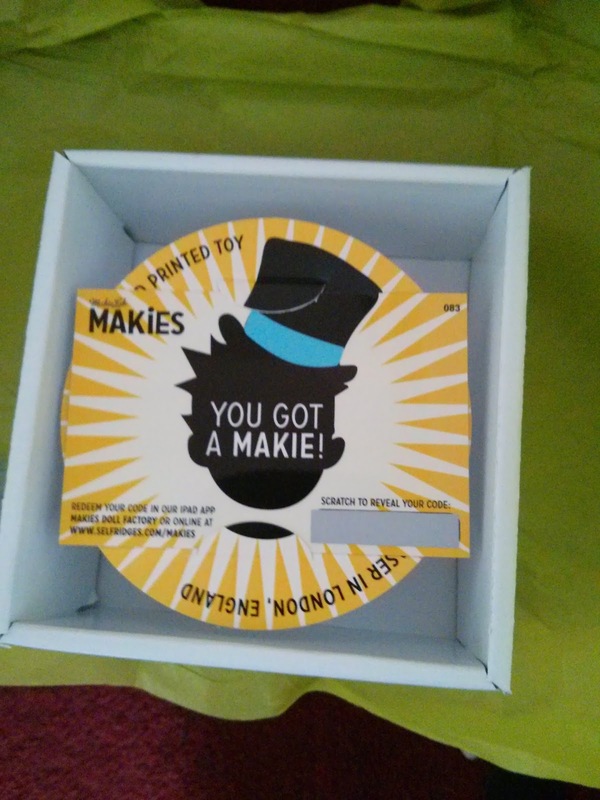 We just have to wait a couple of weeks now for Top Ender to receive her doll, and we'll post again then so you can see how lovely Stella looks, but if you're after a gift for a technology loving child who also loves dolls then I suggest you visit the Makie website. We were gifted a doll, to do a review. 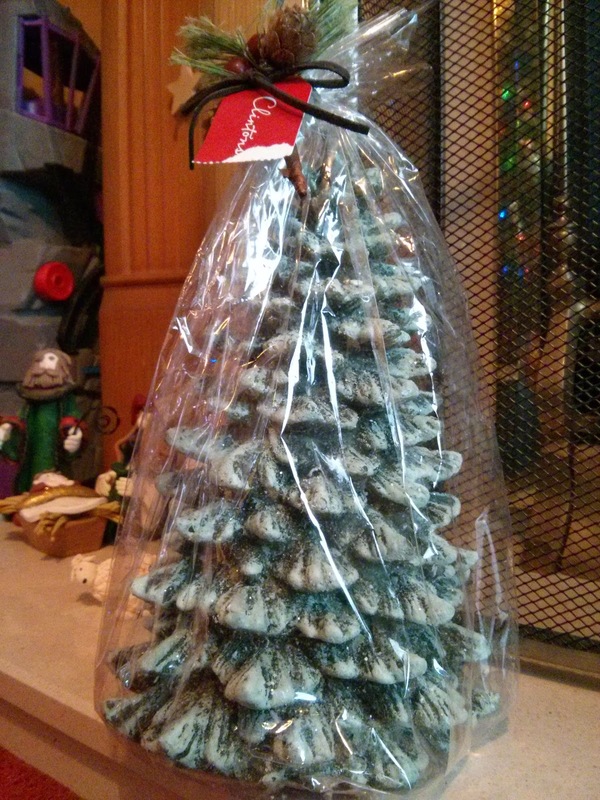 Every year I buy a couple of new decorations for one of my Christmas Trees (you know I have more than one right?) as I'm planning on being able to give Big Boy and Top Ender a few decorations when they move out that mean something to them and show a history of their lives too. 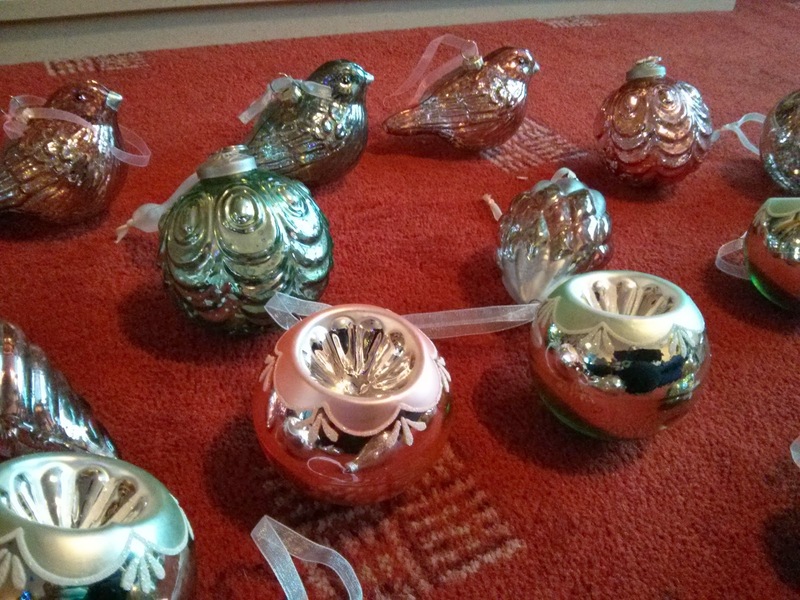 John Lewis asked if they could send me a few decorations from their Vintage Market Bauble range and seeing the glass birds I had to say yes! The decorations arrived after School and Big Boy helped me to unpack them, examine them to see which ones we loved the most and then Big Boy sorted them into groups of similar styles before letting me put them on the tree. A lot of the decorations reminded me of the ones that my Gran had when I was young, and being glass they seemed as if they really could be the ones that she had. 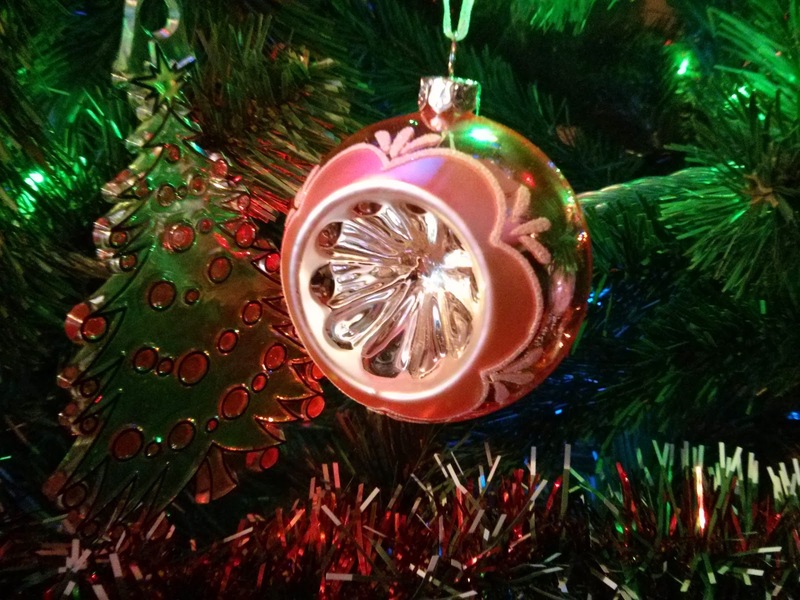 Later when I was playing around with my phone I discovered I could make a clever little video of some photographs I'd taken, so this is my video of my baubles, I hope you like it! The decorations are beautiful, they're well made and the range has made me terribly nostalgic. I'm not sure if it's the soft colours of the set, or that they are hand painted glass or that they are hung using ribbon but I think that these are my favourite tree decorations this year. The decorations were sent to me to review. I have a lot of traditions that I keep up at Christmas time, some are from my childhood, some are from Daddy's, some are ones that we've developed as a family, stolen from other famlies and some we have no idea where they came from, but we love them all the same. We traditionally put up our Christmas decorations at the start of December, as close to the 1st as possible, which sometimes means putting them up in November! This year with the 1st December being a Sunday we were able to put them up on the 1st. We do this as we like to have our decorations up for all the Sundays of Advent, to help us to focus our thoughts on the reason for the season and because December gets really busy for us so having a free day to do the decorating is rare! Plus, with the number of trees we I like to put up, we need to start early. A tradition I magpied from another culture happens on the 5th December, unless I forget in which case it happens as soon as I remember! After the children and I have done all our usual evening chores, we leave our shoes nicely cleaned by the front door awaiting a visit from Saint Nick (aka Sinterklass). If we've been good then he'll leave us treats in our shoes and if we've been bad, well we'll find a willow branch to be spanked with. So far we've been lucky and there hasn't been any spanking going on. One of my favourite traditions is the annual trip to the Panto. We have done this as a family every year since 2009, when Big Boy was One. This annual theatre trip used to find Top Ender and Big Boy crashed out before the end of the performance, but they loved it as much as we did because of the noise and the repetition and because Panto's are just fun! These days they love the light whizzers and the chance to get an interval ice-cream and joining in with the songs and shouting at the Performers on Stage. This year we're off to the Milton Keynes Theatre Panto which is Snow White and The Seven Dwarfs, book your tickets now if you're still waiting! The next tradition is our Church Nativity, before we perform it at Church (I say we, I just add volume to the songs as it's Children only in the Nativity!) we perform it at a local Old Folks Home, after which we stay and sing Christmas Carol's with the residents and have a bit of Cake or share Mince Pies with them too. It's such a small thing, to give up a couple of hours to bring some Christmas themed entertainment but it brings such enjoyment to the residents of the Home and to the Staff and I think it's important for the children to learn that Christmas isn't just about receiving. 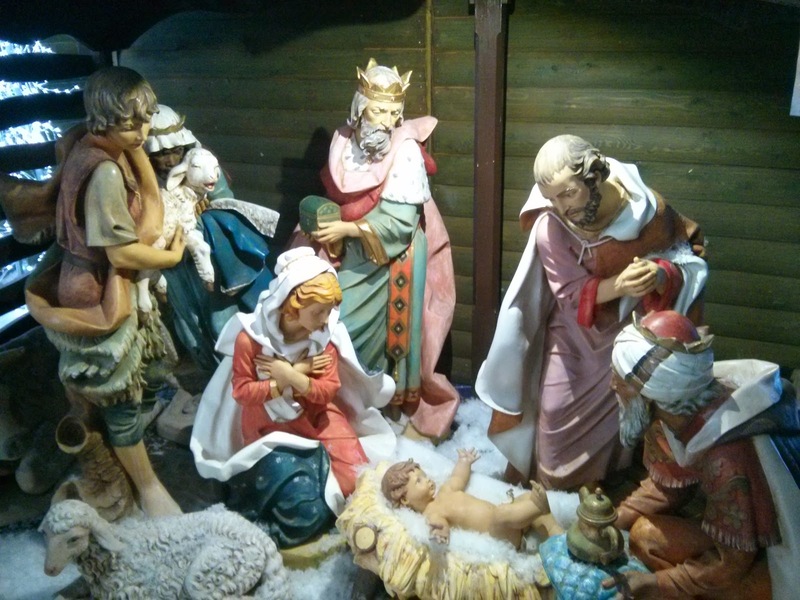 It's not until the following Sunday that we perform the Nativity at Church and then in the week after we have various Carol concerts, School concerts, the School Nativity and as I said our schedule starts to get a little filled up, but we love it. Smooshed up through out the month are a few car rides to the homes that we know decorate the outside with more lights than might be strictly necessary and plenty of walks around the local neighbourhood to look at the Christmas lights that people have put outside their homes. At some point there is a visit to Santa, this year we are going to visit Santa at one of our local Garden Centres and have Tea with him. We've done it before, and it's great fun being able to spend some time with Santa, have a chat with him about what we'd like for Christmas and of course get a gift to take away too. We're really lucky with Santa, that he gets to take some time out of his schedule to have lunch or tea with some children around the world. The North Pole magic brings out the magic in everyone. Again, if you're looking for something magical to do with your family this Christmas, these sessions are brilliant to get everyone feeling that special magical Christmas feeling. One of our last traditions that I can think of at the moment, is one which is a bit like Christmas Marmite for some. We have an Elf from the Elf on the Shelf range. Actually, we have two Elves, but that is besides the point! For us having Jingle and Belle here isn't about the threat of having to behave or if they don't then the Elves will tell Father Christmas that we've been naughty, and our Elves aren't naughty really either. 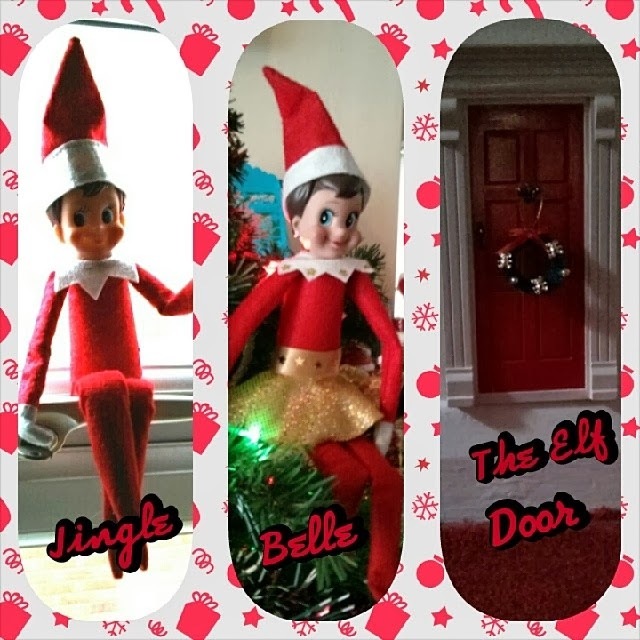 For us having the Elves in the house is a bit of Christmas fun that we love to join in on. The Children love running around the house each morning finding where Jingle and Belle have hidden themselves although we're still not sure if they are romantically involved or Brother and Sister. I just love that I get to have another spreadsheet, keeping track of where the young elves have found themselves and that they bring us new pyjamas on Christmas Eve (oooh another tradition!). We have been given tickets to see the Panto and tickets to visit Santa, but if we hadn't we'd be doing it anyway! On Monday morning, after dropping Daddy off to the train station I noticed that something wasn't quite right with Big Boy. He wasn't his normal early morning self and with him having a higher than expected blood sugar I decided to keep him off School. It was a good call, he spent most of the day slobbed on the sofa cuddling into me and even the promise of a McDonalds didn't raise his spirits for long. We watched a Christmas movie together, which I was hoping would allow him to sleep a little so I could do a little tidying up, but the magic of the film had us both engrossed and there was no nap (or afternoon tidying session). On the Tuesday morning I knew that Big Boy wouldn't be going to school. He'd been up most the night coughing and spluttering and generally feeling sorry for himself, and so had Top Ender. Both children were tired, feeling low and badly in need of a day where they could blow their noses, drink plenty of fluids and just rest. We did sneak up the City centre at one point during the day as I needed to collect a Christmas present that had been delivered to store, but for most of the day they were cuddled up on the sofa under a pile of blankets sipping a never ending supply of juice. I'm a big Christmas Movie fan, I normally watch at least one a day in the run up to Christmas and have a rather large collection which I am always adding to, so come the afternoon, I suggested that maybe it was some time for some Christmas movie magic. It had worked the day before with Big Boy, who whilst cuddled with me on the sofa watching the film had forgotten that he was so poorly. Our lovely multi region DVD player came in handy, as I'd been sent some great DVD's that I didn't realise were Region 1 until I went to look up when they are available to buy here in the UK. Am I odd in watching a Christmas movie a day in the run up to Christmas? Or do you have a habit which is much worse?! And I'm not the only one that thinks that Christmas movies are magic am I? The DVD's were sent to us for review. 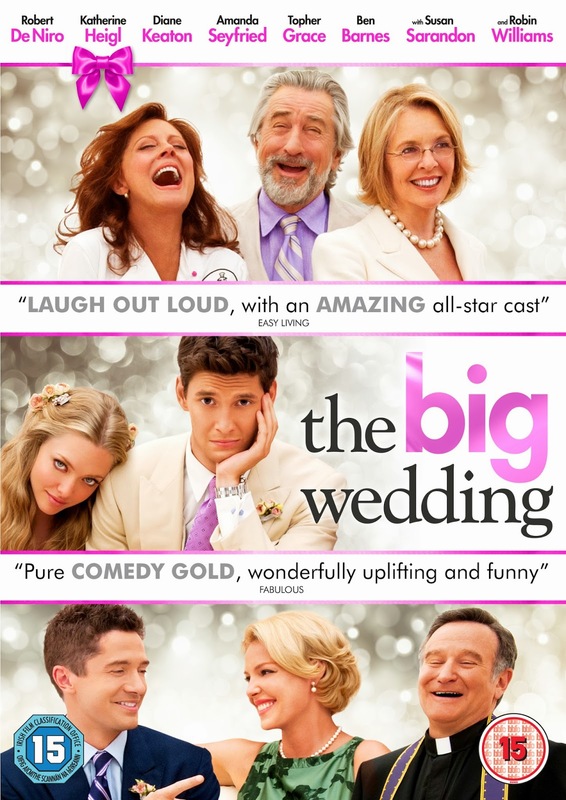 They are available to buy on import at the minute, but you know they are great holiday films! Big Boy hasn't been allowed in the kitchen for a few days. Nothing unusual there you might think, but seeing as both the children normally have free reign over the house it is unusual for us. The problem is that a gift has arrived, a large gift that I can't put in any other room. Our garage is still drying out after being accidentally flooded by next doors burst water pipe, it's too big to put in the boot of the car, or the loft, or my bedroom and everywhere else would be really hard to keep Big Boy out of! 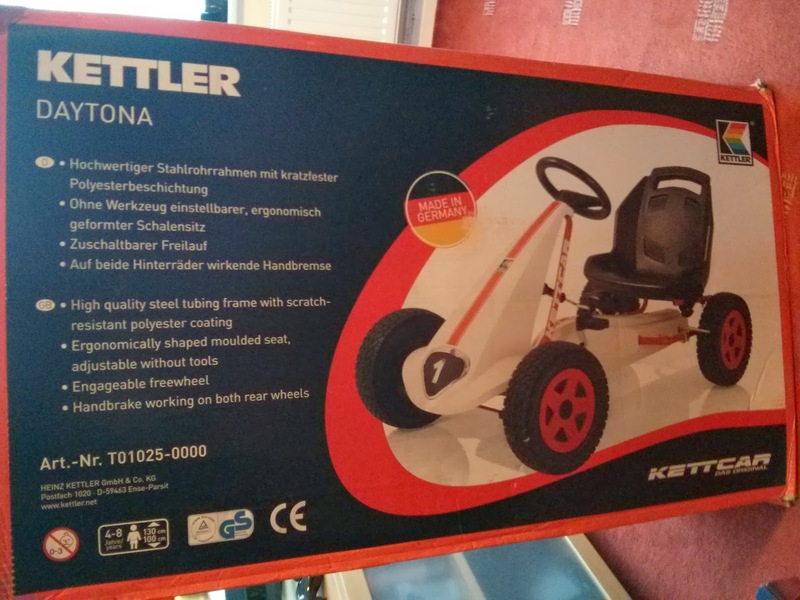 The gift is a Kettler Daytona Pedal Go-Kart, something that we were asked if we'd like to review and something which Daddy and I knew would be a great Christmas gift for Big Boy who would go nuts for it. 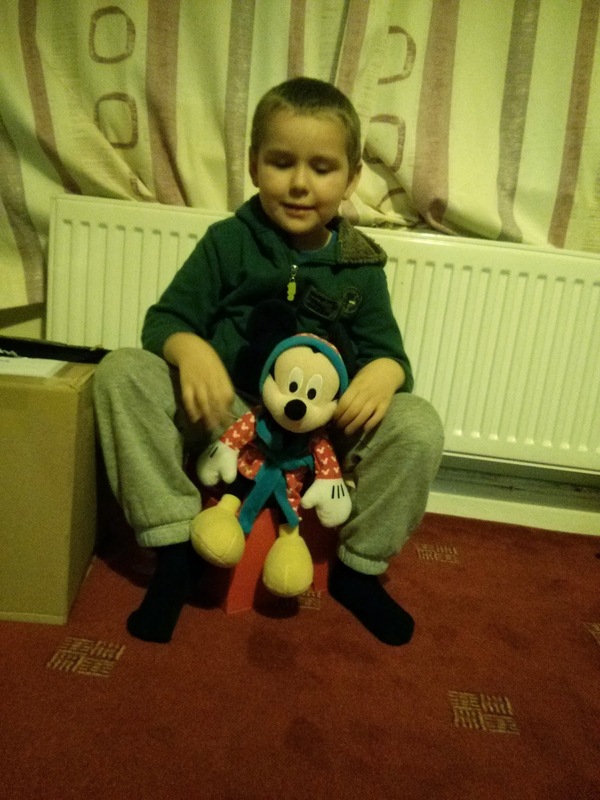 We knew if we let him have it before Christmas, that it wouldn't matter what else we did, no matter what we did with regards to Nativity's and visiting Santa, going on Christmas light hunts, the go-kart would be the only thing that mattered to BB, so we decided to hold off on giving it to him until Christmas Day. I have waited until Big Boy was in bed asleep before getting the packaging open and taking a look, the go-kart is seriously cool, I mean with an RRP of £159 you'd expect quality, but it is really well made. Daddy is itching for it to be Christmas Eve, so he can put it together and then wrap it before putting it under the tree for Big Boy to open on Christmas Morning. Big Boy is aware that one of his gifts is in the kitchen, he's slightly confused as he thinks it might be food (as that's what is normally kept in the Kitchen) or possibly some cleaning products but I know that come Christmas morning he'll be over the moon! We were given the Go-Kart to review. There will be more pictures and some video and no doubt another blog post come Boxing Day! I've long been aware of cashback sites, the idea of getting money back after having paid out for something I was intending to buy anyway appeals to me, but I've never really utilised them, like Daddy does. Daddy is the master of using Cashback sites, in our family. He's had cash back on insurance, a mobile phone contract, breakdown insurance and probably much more that I've forgotten. I'm the occasional user, sometimes I think about using the sites and more often than not I forget. 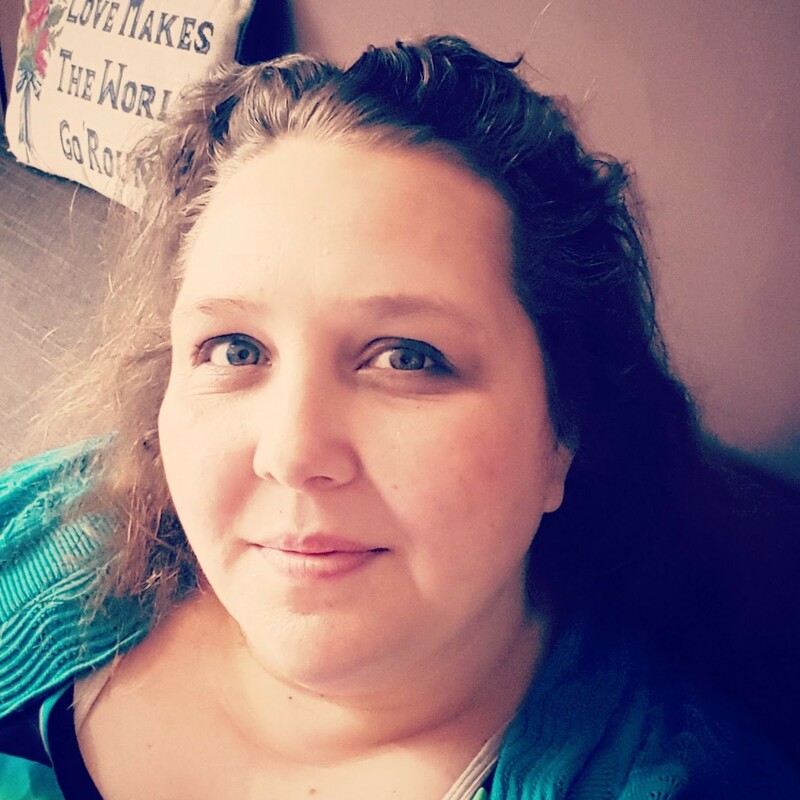 When Top Cashback asked if I'd like to see what I could save, by using their website to do my Christmas Shopping and as an added bonus they'd give me some money to get me started I thought I'd be best to give it a whirl! So I signed up, put in all my information and got ready to start shopping. After having signed up the very first thing I did was clear the cookies on my computer. I know that the cashback sites work by using the cookies to track where I'm going, so by clearing my cookies I was hoping that it would make sure that I'd get all my cash back, as the website would be able to attribute the visit to them instead of deciding that I'd visited a comparison shop or something else. With the Cookies cleared I typed the first name of the first shop I wanted to visit in. I ended up visiting about twenty different shops, and not buying anything before realising that this year I've actually made a bit of a mistake with my Christmas shopping, other than a couple of things that the children have mentioned they'd rather like I've not got a list of what I want to buy! So I went offline and started thinking. I created a spreadsheet with my budget, all the people I'd like to buy for and thought out all the things I'd quite like. Once that was sorted I went back to the shopping. First of all I visited WH Smiths, where I purchased a small number of books. £44.18 lighter but with cashback of 5.25% (£2.31) coming back to me when it had been processed I still had £38.13 left to spend of the money Top Cashback had given me. I visited JD Sports and brought myself a new handbag for a grand total of £6 as it was in the sale and had cashback of 2.1% added to my list of items that were to be purchased (12p). I then went to Amazon to buy new headphones for the children for £20.98, I'm not sure if I was eligible for cashback on these, so I'll be watching my account with interest! As part of a deal with my sister, I purchased some presents from ELC for her, a total of £116 with cashback of 4.2% (£4.87) she doesn't know about the cashback, so if we don't tell her we'll claim it's my "finders fee" right? 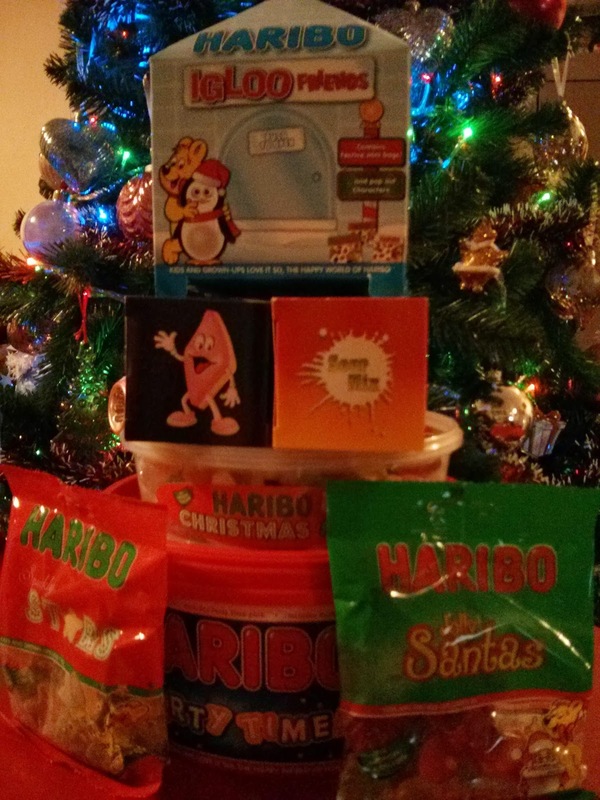 I decided to get some sweets from Chewbz Retro Sweets for a friend with a very sweet tooth for £9.95 with cashback of 15.75% and a 10% (£1.41) discount on top of that. The last gift that I had planned to buy was for one of my Nieces and when I saw some cute little building blocks with the alphabet on, I thought she'd love them. They were £7.50 at The Entertainer and with cashback of 8.92% (66p) It means that from my original £80 including the sneaky cashback I've got from my Sisters purchase I've got just over £10 in cashback and I'm not even finished shopping properly yet. And then because I was congratulating myself on a job well done, I went to Domino's via the Top Cashback site and ordered dinner for cashback of 1.05%. Sure it might only be about 24p that I get back but it'll make my pizza all the more delicious! Well, to be honest anyone who doesn't use a cashback site when shopping online is a bit of a fool, as it's an easy way to get some "bonus" money from your budget and with Top Cashback paying out the cashback in a variety of ways (vouchers for various stores, paypal, BACS) you could easily find a payout method that suits you oh and if you do want to sign up, would you mind using my link PippaDawn as that way I might earn a bit more for Christmas! Using the site is really easy, you just search for the store you're hoping to buy from in the search bar, or you can search through by category (and find shops you didn't know existed!). Just whatever you do, make sure you stick to your own budget and remember that the cashback is an added bonus not a given! We were asked to review the site and given some money to spend too.